Beat the winter blues with Aikido. 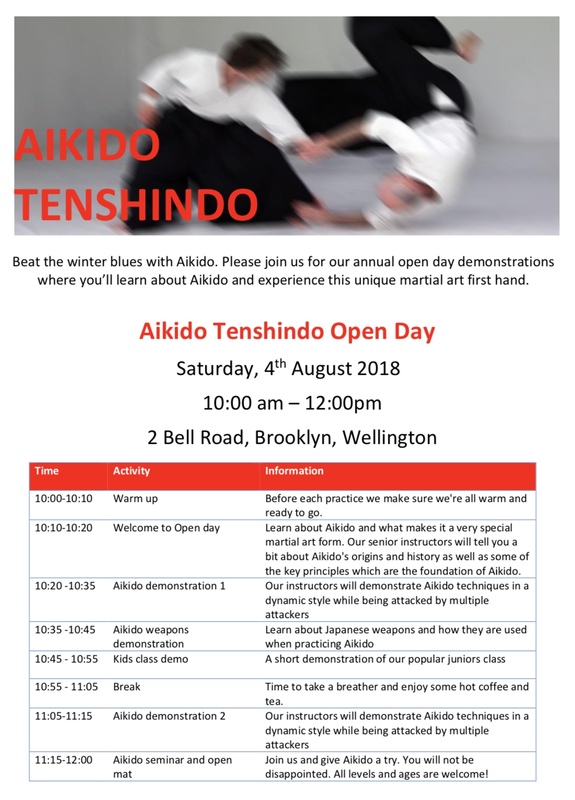 Please join us for our annual open day demonstrations where you’ll learn about Aikido and experience this unique martial art first hand. Sign up on Saturday and train for free all of August, kids will get the term for half price. Bargain! Warm up: Before each practice we make sure we’re all warm and ready to go. Welcome to Open day: Learn about Aikido and what makes it a very special martial art form. Our senior instructors will tell you a bit about Aikido’s origins and history as well as some of the key principles which are the foundation of Aikido. Aikido demonstration 1: Our instructors will demonstrate Aikido techniques in a dynamic style. Aikido weapons demonstration: Learn about Japanese weapons and how they are used when practicing Aikido. Break: Time to take a breather and enjoy some hot coffee and tea. Aikido demonstration 2: Our instructors will demonstrate Aikido techniques in a dynamic style. Aikido seminar and open mat: Join us and give Aikido a try. You will not be disappointed. All levels and ages are welcome!